Guadiana 36, 13002 Ciudad Real, Spanje. 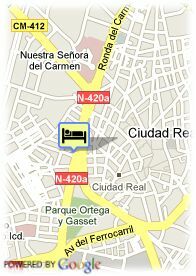 Elegant luxury hotel in Ciudad Real. 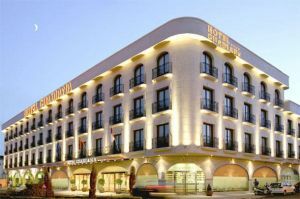 The Guadiana is located at just few metres from the centre of Ciudad Real and from important places such as the Congress and Exhibition Centre, the bus station and at just 10 minutes from the AVE. With classical atmosphere, the establishment provides 102 luxury rooms, among which stand out 11 are large suites. Moreover, it also has 6 big meeting rooms with capacity for up to 600 people, equipped with the best audiovisual technology, the ideal place to hold any kind of events. In its restaurant El Rincón de Cervantes, with elegant and nice decoration, the guests can taste the best cuisine. After eating, they can enjoy a tasty cocktail in the Cafeteria-English Bar. The establishment also offers a business centre with luxury offices which are fully equipped. Betalende overdekte parking aan het hotel (7.49 €).